This week was a roller-coaster of a week. We had a lot of great experiences and we also had a few disappointments. Firstly, a few of the people we were teaching had some difficulties with their families and couldn’t continue, so that was a little tough for us. However, we had lots of success stories this week. First, Eusebio and Isabel are a father and daughter who are living here in Chile for better employment and send money back to their family in Bolivia. We found them last Sunday, and we have taught them a few times and we were just amazed at their humility and faith. We went to church together, and it was a great experience. We asked Eusebio to present (introduce) himself in the gospel principles class and he stood up and gave everybody a hug, haha it was awesome! So they are planning on getting baptized on the 30th of June, my last day in La Serena. We taught them commandments that oftentimes are hard for people to accept and live, like tithing and the word of wisdom. They listened intently, and they both showed extraordinary faith by committing to live these commandments regardless of their economic circumstances. I know they will be blessed for their obedience. Second, Vanessa and Felipe are a young couple that we have been teaching for about a month. We taught them about forgiveness and we left them with the Savior´s teachings about the subject to read. Vanessa read and prayed and as she did she began to feel desires to forgive her father, with whom she had not spoken for more than a year. She wrote him a letter, forgiving him for everything that had happened and sent it yesterday on father´s day. She told us that it was a changing point in her life. Also, we had taught them the law of chastity and they made the decision to get married. Because of that decision, we had promised her that she would find work in La Serena. Monday of last week, two days after they had made their decision, she found a job that was perfect for her. She had been looking for months without success, but was blessed for her obedience to the commandments of God. Third, we have been teaching a really cool guy called Andres. He is a student here in la Serena and he actually stopped us in the street because he had heard about our church and wanted to learn more. He told us that we could never, ever convince him that our church was true. My companion and I looked at each other and kind of laughed because it was true, we never convince anybody that we represent the true church of Christ. We told him that we would not convince him, rather that God would do it. We know that anybody who reads the Book of Mormon and prays to know that it is true will receive an answer that it is true. He kind of laughed and said, okay I will put it to the test. We didn`t hear from him all week long and we were worried that we had lost him when he called us up and asked us to go over. He told us that he was smoking with his friend on Friday and began to feel bad for what he was doing. He began to think a lot about what we had talked about. He really felt the desire to change his life and get rid of all of his vices. So he kneeled down by his bedside and promised God that he would give up all of the bad things in his life if God would just let him feel that peaceful confirmation that he needed to do it. He choked up will telling us about this experience and told us that he felt a peace and stillness that "passeth all understanding" and was something that he had never felt before in his life. He told us that we was willing to follow Jesus Christ and he wanted to always feel that peace in his life. I have seen and I know from personal experience that God answers our prayers and He wants us to follow Him. I am so sure that any person who asks with real intent, wanting to know, and with faith in Christ, can know that our message is true. Jesus Christ is our Savior, and He has restored His church through prophets in these our days. I know it! Hey this was a really great week. Some of the highlights were learning how to make empanadas, traveling to Viña del Mar, and eating pizza and watching a movie with all of the missionaries in the zone. This week we had a pretty great week as far as the people we are teaching right now. Felipe and Vanessa had a pretty big decision to make this week, because we talked a lot about marriage. We still haven´t heard from them what their decision will be. Willer came to church and is just loving it. He will be baptized on the 22nd for his mom´s birthday. Maribel and her son went to church this week for the first time, and they loved it. We also found a brand new family this week that are from Bolivia. They are awesome! I think they are going to progress very quickly. 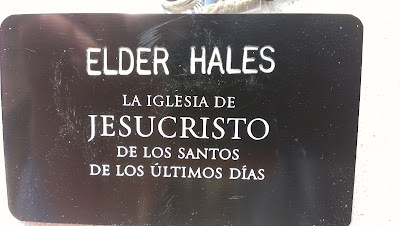 Felipe Mathus received a new calling, and he is working hard with the young men. I feel like he has progressed so much since I first met him, and it is just amazing to see the change in him. Well the truth is I am only going to write two more blog letters, so I just wanted to say the things that have been most important to me on my mission. 1) Prayer, and the knowledge of a real Heavenly Father who has a body of flesh and bones who knows and loves me. 3) Learning to recognize the workings of the Holy Ghost in all of His functions. 4) My family. The knowledge that the family unit can exist beyond this life. 5) The Church of Jesus Christ of Latter-day Saints. 6) The friends both in Chile and home who have supported me and taught me so much, thank you! Hey guess what? Today I am going to learn how to make empanadas, and we can make them when I get home! It should be super yummy. Hey so this week was sweet. Felipe and Vanessa both went to church again and so did our friend, Willer, and a new family that we found this week. Willer is a 13-year old joven (youth) that we have been teaching for about a month now. He is really excited to go to church and he is even more excited to get baptized. This week we had a great experience that was definitely an answer to my prayers. We have been trying to talk with as many people as we possibly can about the gospel and we even talk to them in the street. Last Thursday my companion and I talked to a really nice lady who was coming home from work. She seemed a little down, so we tried to cheer her up a little bit. She invited us over to her house the next day. We went and taught her Friday and Saturday. Sunday she went to church with her entire family, and they are progressing well. The most amazing part of this story was the fact that earlier in the day, in fact just seconds earlier, we talked to a lot of people who were disinterested in learning more or even hearing about God. Then, we found the right person at the right time with the right message. I know it was not coincidence that we found Claudia and her family. So this week we have my last trip down to Viña del Mar on Friday. I am very excited to go and to participate one last time. I will be able to bear my testimony that day about the mission and my experience here in Chile. Greetings from.... La Serena! Haha I stayed here, and here I will finish my mission. My new companion is.... Elder Larsen! He was trained by my old comp, Elder Hancock. 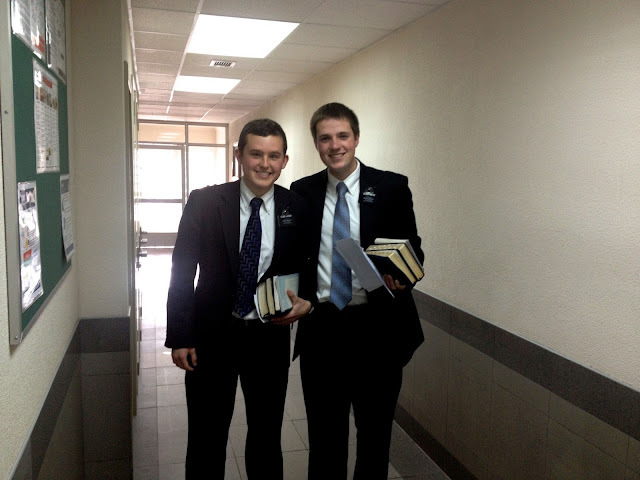 Elder Nicholas Andrew Larsen has lived in both Utah and Florida, and has been in Chile almost a year now. We have had an awesome week of work together, and I think it will be a very fun month and a half together. This week we worked hard with a few of the people we are teaching and we had Vanessa and Felipe at church. I think they really liked their first time there, and all the ward seemed to fellowship them well. Vanessa is a teacher and Felipe is still studying in college, they are just a few years older than I am. So this week we had seven new missionaries in our zone, and we lost five. Therefore, we had lots of work to do getting all of the new missionaries at 3 and 5 in the morning and coordinating with members to take them to their new homes. Even though we had lots of work to do with the new missionaries, we were still able to teach lots of families and we even found a few new investigators. Elder Larsen loves talking with everybody, no matter where we are. It is definitely contagious, and I have been doing my best to keep up with him. We also are planning on going to a family´s house on Monday of next week in order to learn how to make Chilean empanadas, which should be a blast. I am more and more amazed at the amount of sister missionaries that are arriving at the mission. 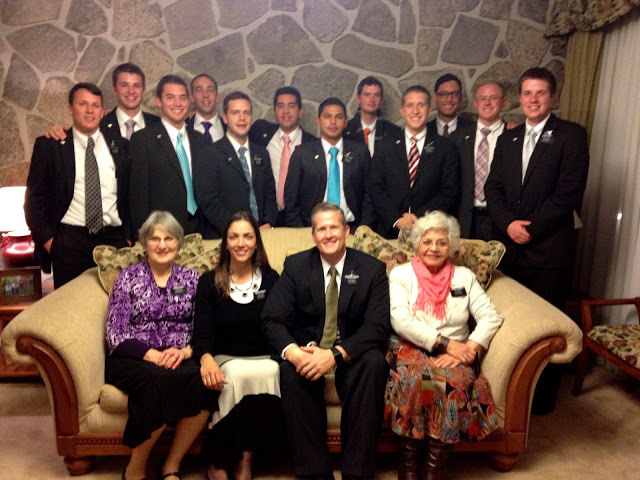 Six months ago we had maybe 25 sister missionaries in our mission. Now, we have over 70. Also, they are hard-working and obedient missionaries that are going to be very successful here. It is exciting for me to be a part of the mission, Viña del Mar. I love it here! I hope you guys have a sweet week! We hold missionary coordination around the kitchen table. After the meeting, breakfast. One week it was chocolate chip pancakes, banana pancakes and yes, regular pancakes. Last week it was egg burritos for breakfast. The toll: 15 eggs, a block of cheese and a jar of salsa, half a pound of bacon, some diced ham, cocktail sausages, two cans of black beans and two dozen tortillas. Also, two large cans of fruit cocktail and two bottles of juice. In fairness, I had a couple myself. 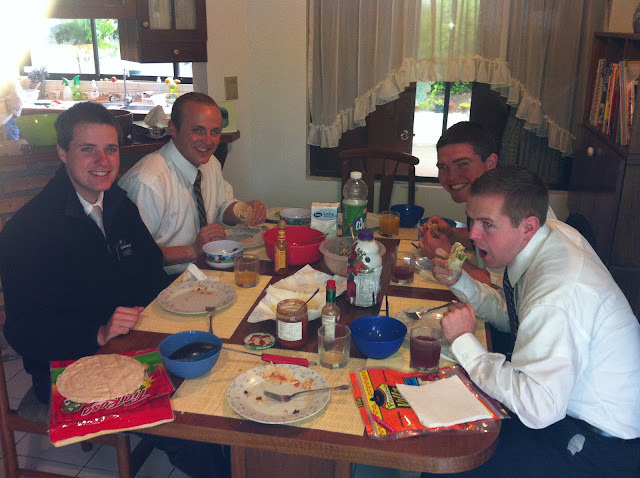 Elder Hancock set a modern record, eating 10 self-rolled burritos! 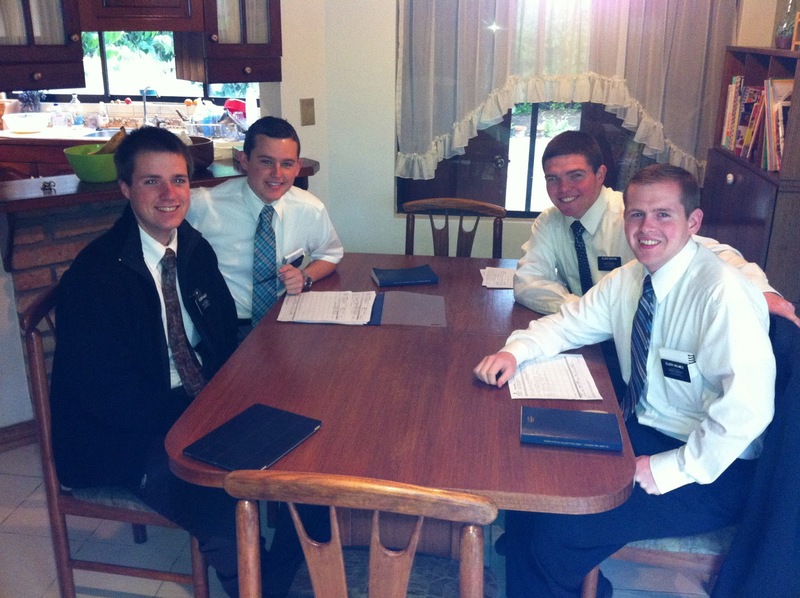 Elder Hancock has been home for a few days now. We wish him well and thank him for loving and serving the people of Chile. So there is a kind of sameness to the pictures, isn't there? 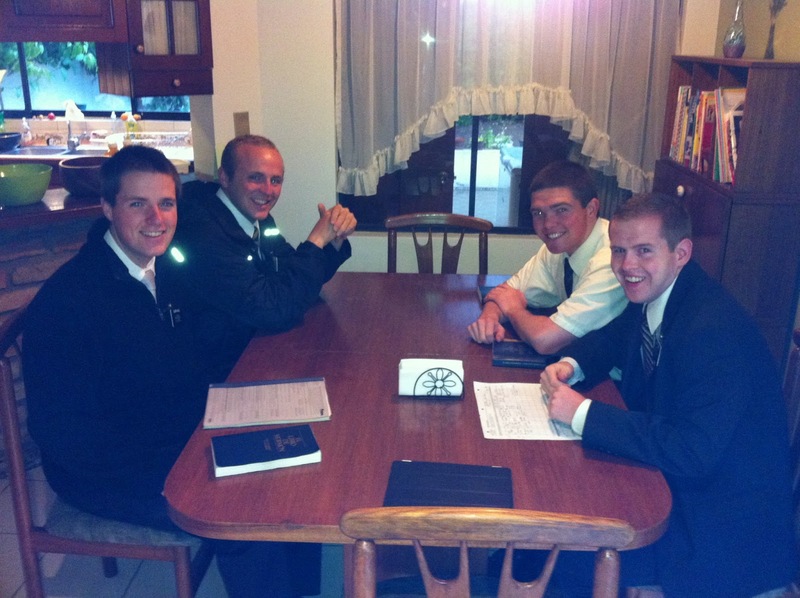 This week Elder Larsen (let's say he's from Utah, though his family has wandered some) arrived safely in La Serena, to fill in behind the recently returned Elder Hancock. As a new missionary Elder Larsen was trained by Elder Hancock—in the town of Vicuña—so it's kind of a fun replacement. Thanks to all for raising mission-worthy sons. Gathered around the table at the Thompson's for coordination meeting. The next week everyone's in their same places around the table. Egg burritos!! 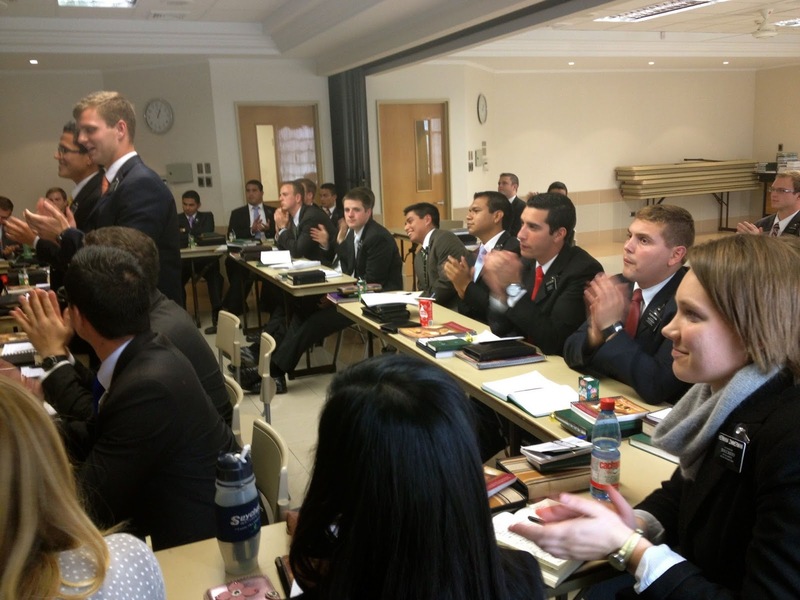 Once again gathered in their places, but Elder Larsen has taken Elder Hancock's spot. Well, this week was crazy. Haha my companion, Elder Hancock left yesterday to go to Viña, and will be home this Wednesday. We had a really good last week together, it was really fun and we were really busy. The best part of the week was, as you can imagine, Felipe´s baptism. He got baptized on Saturday, along with another kid named Tsuyoshi. Felipe had been investigating the church for over a year, and so a lot of people from the ward came to support him. 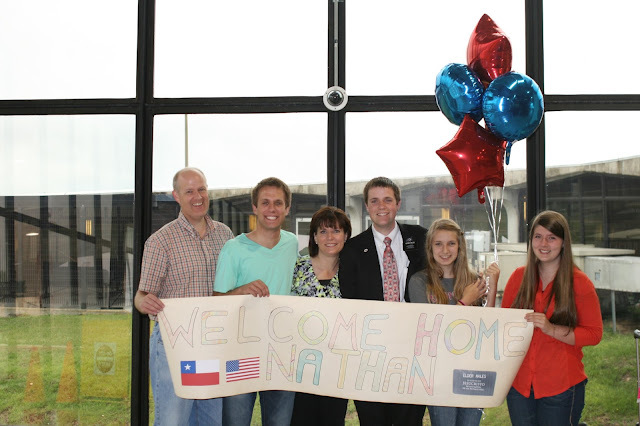 I was really happy, and was able to talk to a lot of the missionaries who had worked with him during the year, and they were all very happy. He told me that the reason why he got baptized now was because he wanted to be a good example for his kids, and he also knew that this was what he needed to do to progress in his life. After the flurry of baptisms that we have had in the ward this month, we have a lot of work ahead of us in order to strengthen and help the new members. At the same time, we need to work with all of the friends and family of these new members who haven´t had the chance to learn about the gospel. So I should be getting my new, and last, companion this Thursday. I am really hoping that we are going to be able to work really hard for the next month and a half that I have left in Chile. There are so many amazing people and families that we have been teaching here, and I really hope that the work carries on with them. I know that, because of Jesus Christ, we can all be together in families after this life if we are prepared and worthy. Hey guys happy mother´s day!! It has been a very, very busy week, but it has been really fun! On Thursday night we traveled down to Viña again, and we had a little bit of time to go to Valparaiso for a few minutes, so that was really fun. It was companion´s last time going down to Viña, and my second to last time. We got home early on Saturday morning and we spent the entire day getting ready for the baptism of Abel, Elinor, Carlos, Natalia, and Nicholas. It was an excellent service, and I am sure that we all left edified. On Sunday, they all received the gift of the Holy Ghost. I also was able to talk to my family on the telephone for the last time in my mission. It was really fun to talk to them and share some time together. Well, just in case anybody was wondering, I have seven weeks left in the mission, so if you want to send me a package or letter, this would be the week to do it, otherwise it might not get to me. Well I have been studying faith lately, and I wanted to just share something small that I have learned. Belief is an acknowledgment that something is true, a conscience acceptance based on results of an investigation. However, belief in God, in and of itself, is not sufficient to reach salvation. Rather, we must have a positive, empowering motivation that leads us to act on our beliefs, that is to say, we must have faith. Many believe that Jesus Christ is the Savior of the world. Few have the faith sufficient to follow His teachings, and keep His commandments. In the same sense, knowledge is to wisdom as belief is to faith. We may know that touching the hot stove will burn us, but if we fail to apply that which we know, we are burned just the same as he who is ignorant. Knowledge is only useful when applied. Belief is useless when left on its own. Let us have the faith and wisdom to learn what God´s will is and to follow His commandments. The baptisms of Abel and Elinor!